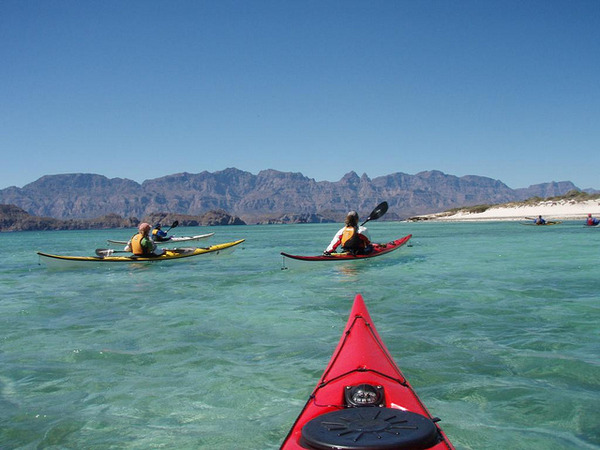 9 days kayaking trip near La Paz, on the sea of Cortez. 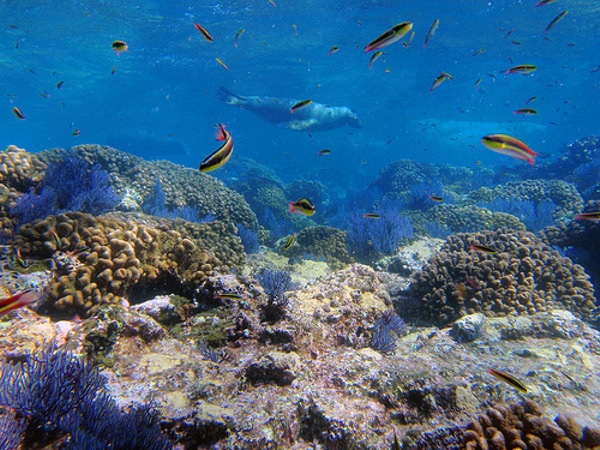 Discover what Jacques Yves Cousteau once called "the world's aquarium". Arrival at La paz Airport (flight ? at ? ), reception and transfer to your hotel. 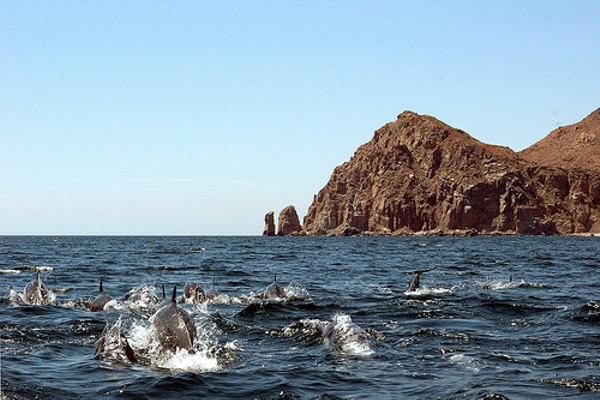 The island is surrounded by clear and turquoise waters, and was declared a nature reserve along with all of the other islands of the Gulf of California. 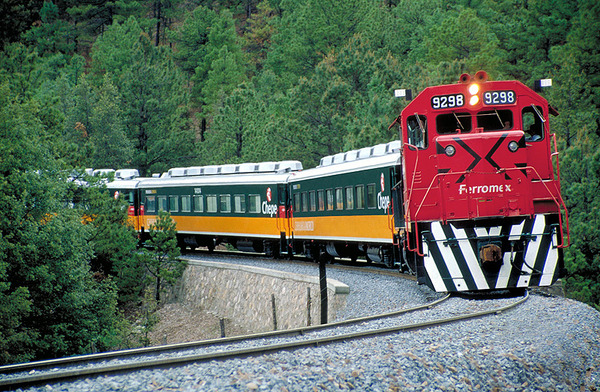 This dream expedition is designed for travelers looking for nature and adventure. Introduction : on average, we will paddle 3-4 hours each day. Every afternoon we will set up our camp on a different beach. The pace of the trip will allow us to have some free time to explore the island, snorkel, or just relax on the beach. During this adventure we will get to observe dolphins, sea lions, tropical fishes, manta rays, pelicans, blue footed-boobies, frigates, ospreys… in their natural environment. From October to May, each kayak expedition is accompanied by a certified naturalist guide and a cook. Travelers can either choose a single or tandem kayak. 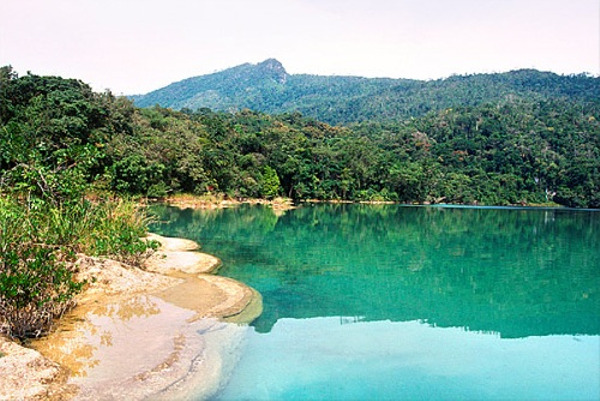 All the camping and kayak equipment is included in the price of the excursion except: sleeping bag, snorkeling equipment, neoprene suit (can be rented on site). 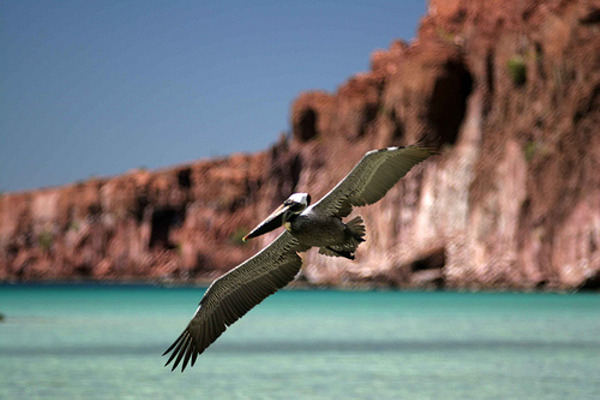 The price also includes meals and drinks on the island, 2 nights in a hotel and a dinner in La Paz. Participatory trip: all participants help in the different chores of the expedition: loading and unloading of the kayaks, set up of the camp, cooking… the weight of the equipment is spread between all the kayaks. Check in at the hotel, before meeting the guides for a briefing of the trip. 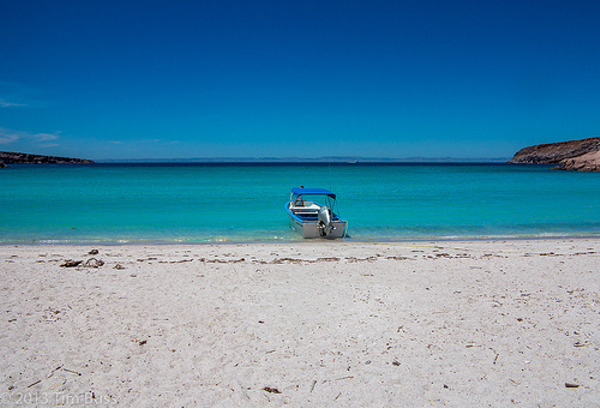 Transfer from your hotel in La Paz to Isla Espiritu Santo on a high-speed boat. With the guides, you will attend a briefing about safety rules, the use of the equipment and kayaks, and the bases of kayak for beginners. In the afternoon, we get on our kayaks and paddle along spectacular volcanic cliffs that border the island before reaching a first sheltered beach where we will spend the night. Dinner and night at the campsite. First morning on the wild island in an idyllic setting. We resume our kayak adventure exploring the surrounding islets that numerous birds have made their home: blue footed-boobies, ospreys, frigates, herons, egrets… We reach a bay that shelters a dry waterfall and freshwater where we can swim after this beautiful day. 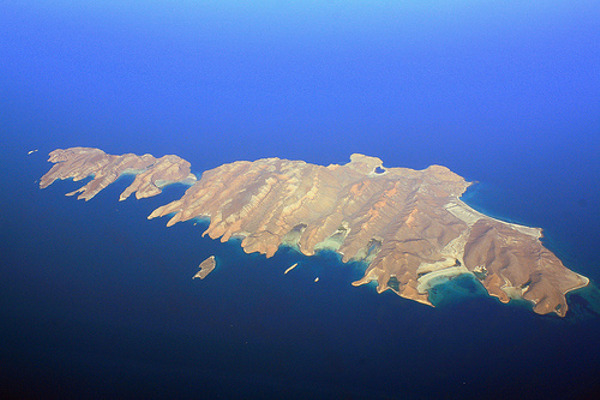 This morning we head north of Isla Espiritu Santo and towards the islet of Partida. If we are lucky we will get to see dolphins and even manta rays. The size of this fish can reach 7 meters! Then we set up the camp on a beautiful beach in the bay of Ensenada Grande. Today we set the kayaks aside and relax. 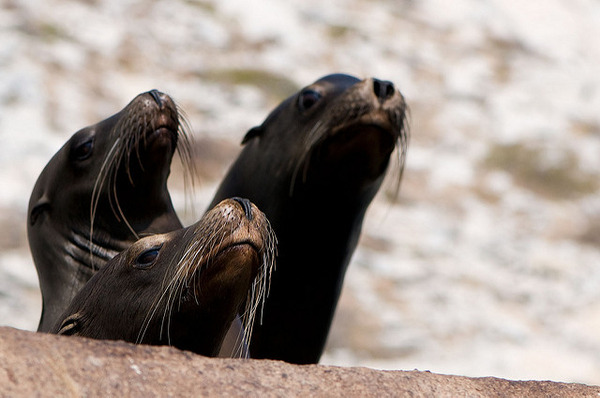 We board the boat and head towards an islet colonized by sea lions. We get into the water for an unforgettable snorkel experience, between tropical fishes and curious sea lions who come close to the swimmers. After yesterday’s relaxing day, we get back on our kayaks and head east of the island. A spectacular landscape is ahead of us. 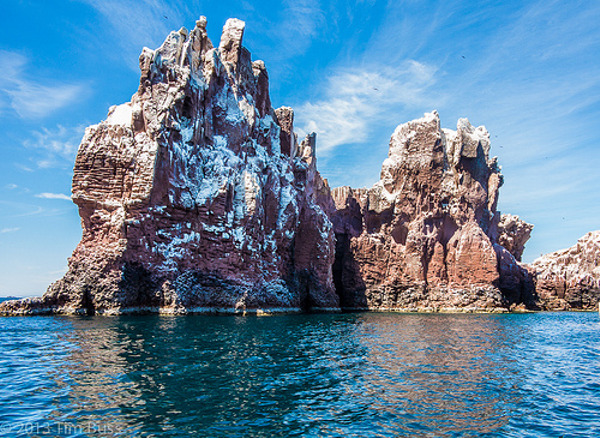 The contrast between the ocher cliffs and the azure of the sea offers a colorful panorama. 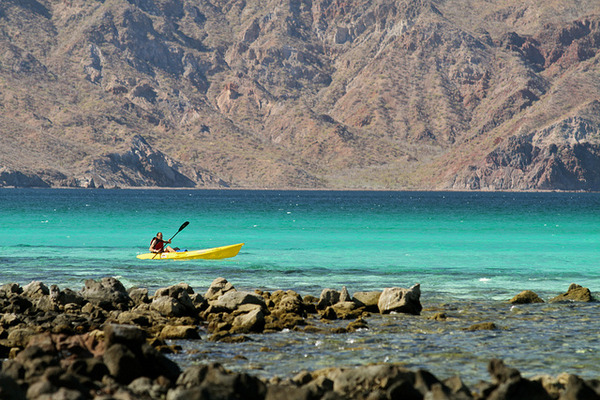 We paddle through a narrow channel between Isla Espiritu santo and the islet of Partida to discover our next stop: a heavenly setting with a turquoise natural pool. Today we will get to admire spectacular cliffs, some of which reach 600m. 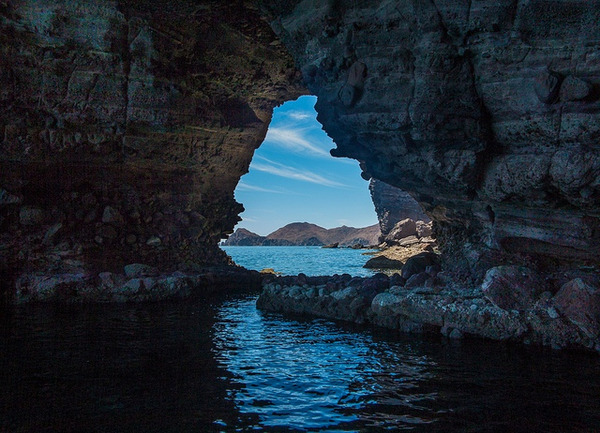 We are rewarded for our efforts when we reach sea caves in which we can seek shelter and enjoy the coolness. In the afternoon, we arrive at our favorite campsite, a 3 km stretch of white sand. In the evening, we make the most of our last night on the island and observe a beautiful starry sky. Last morning of kayaking to close our expedition. We enjoy one last lunch on the island and head back to La Paz. Arrival at the hotel. We go shopping for souvenirs and enjoy a last dinner together in a restaurant in La paz. Dinner and night in La Paz. Breakfast and continuation of your trip. 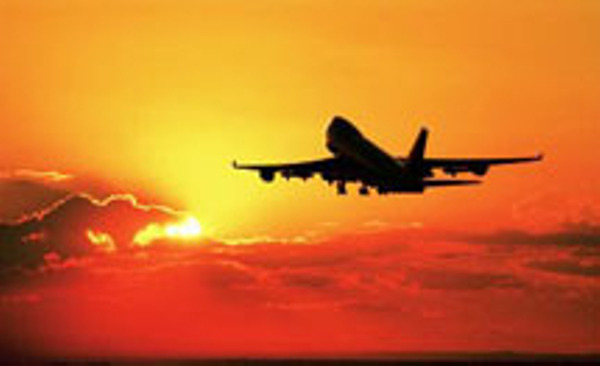 Departure from the hotel to La Paz Airport in private transportation 3 hours before take-off. 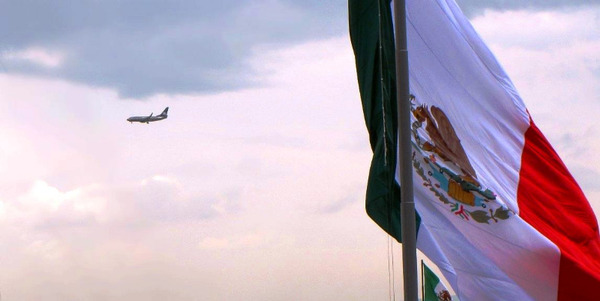 International flight ? to ?.